Choco Toucan (Ramphastos brevis) is a large black toucan found in the lowland forests of the pacific slope of Colombia and northwestern Ecuador, where it is common. It is similar in appearance to the Swainson’s Toucan, except it is smaller and its voice is a croaking sound, whereas the Swainson has a yelping sound. The Choco also differs in that the lower mandible is black rather than chestnut red. 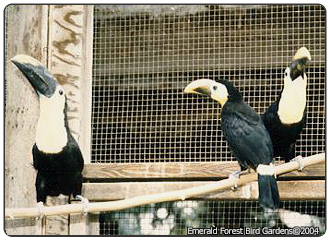 The Choco Toucan was imported only a couple times in the 1980’s and was bred only once and by Jerry Jennings. The Choco may still exist in captivity in the U.S., but it would be in only one collection and not more than three birds. First captive breeding July 31, 1989; Jerry Jennings.